Marches Sub-Aqua Club was formed in 1987 by former members of Hereford Sub-Aqua Club. Marches Sub-Aqua meets twice in the month. One weekend is set aside to go open water diving around the UK. We welcome trained Divers from other organizations that cross over to BSAC on joining Marches sub aqua. • Dive officer has the final decision. 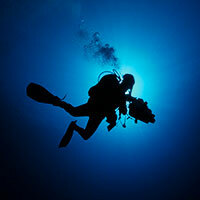 For further information regarding Scuba Diving with the club please see the information page.